Scrapple (Pennsylvania Dutch) is traditionally a mush of pork scraps and trimmings combined with cornmeal and flour, often buckwheat flour and spices. The mush is formed into a semi-solid congealed loaf, and slices of the scrapple are then panfried before serving. Left: Scrapple, served in a restaurant. Scraps of meat left over from butchering, not used or sold elsewhere, were made into scrapple to avoid waste. Scrapple is best known as a regional American food of the Mid-Atlantic States (Delaware, Pennsylvania, New Jersey, and Maryland). 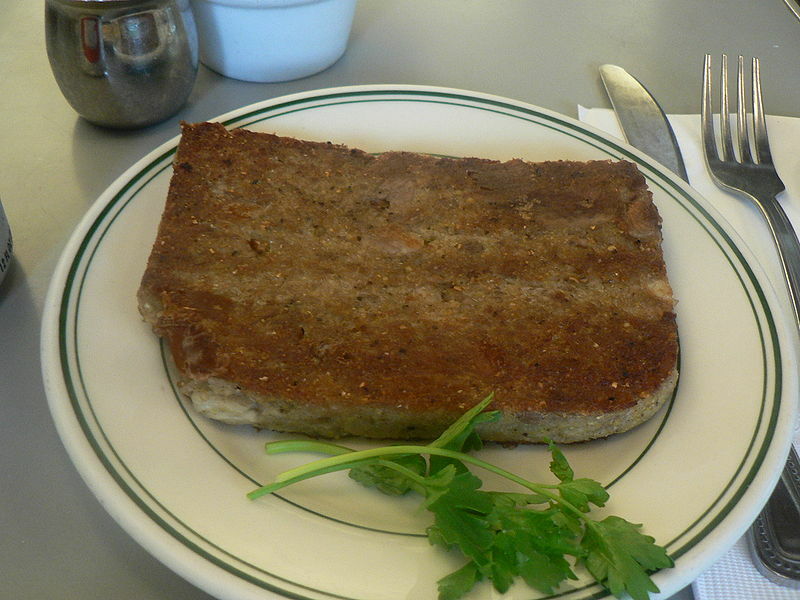 Scrapple is commonly considered an ethnic food of the Pennsylvania Dutch, including the Mennonite and Amish. Scrapple is found in supermarkets throughout the region in both fresh and frozen refrigerated cases, and it can sometimes be found in frozen form in cities as far away as Los Angeles. Scrapple is typically made of hog offal, such as the head, heart, liver, and other scraps, which are boiled with any bones attached (often the entire head), to make a broth. Once cooked, bones and fat are discarded, the meat is reserved, and (dry) cornmeal is boiled in the broth to make a mush. The meat, finely minced, is returned, and seasonings, typically sage, thyme, savory, black pepper and others are added. The mush is formed into loaves and allowed to cool thoroughly until set. The proportions and seasoning are very much a matter of the region and the cook's taste. Commercial scrapple often contains these traditional ingredients, with a distinctive flavor to each brand. A few manufacturers have introduced beef and turkey varieties and color the loaf to retain the traditional coloration derived from the original pork liver base. Home recipes for chicken and turkey scrapple are also available. Vegetarian scrapple, made from soy protein or wheat gluten, is offered in some places. It tends to be sweeter in flavor than typical meat scrapple. Scrapple is typically cut into quarter-inch to three-quarter-inch slices, and pan-fried until browned to form a crust. It is sometimes first coated with flour. It may be fried in butter or oil and is sometimes deep-fried. 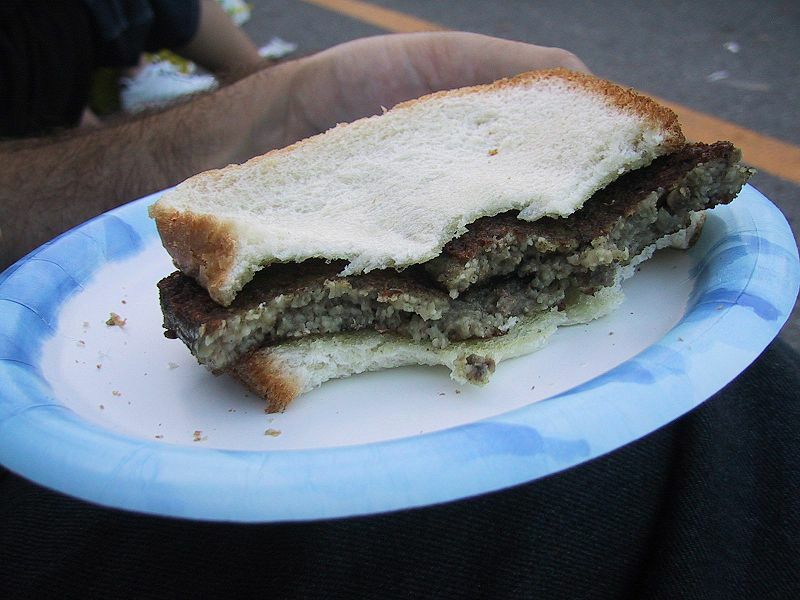 Left: Scrapple sandwich at the Delaware state fair. Scrapple is usually eaten as a breakfast food, and can be served plain or with apple butter, ketchup, jelly, maple syrup, honey, or even mustard and accompanied by eggs, potatoes, or pancakes. In some regions, such as New England, scrapple is mixed with scrambled eggs and served with toast. In the Philadelphia area, scrapple is sometimes fried and then mashed with fried eggs, horseradish and ketchup. In composition, preparation, and taste, scrapple is similar to the white pudding popular in Ireland, Scotland and parts of England and the spicier Hog's pudding of the West Country.